SMN: But do you think that will be worth anything? 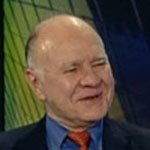 Marc Faber : I don’t know what the end game will be, and whether we’ll still be alive or whether we’ll be in wars or in revolutions as the worst. That’s why I want to hold some physical gold. There’s no point to hold physical gold somewhere in the sky. I would hold some physical gold in my proximity. In other words, I own some in Thailand and some in Hong Kong. I still have too much in Europe, but over time, I will move it to Asia.